The Management Board has five members and is responsible for achieving Atradius’ aims, strategy, policy and results. It has a legal duty to be guided by the interests of Atradius and the businesses connected to it. The General Meeting has the authority to appoint a Management Board member on the recommendation of the Remuneration, Selection and Appointment Committee of the Supervisory Board. Isidoro Unda was appointed Chief Executive Officer (CEO) of Atradius N.V. in July 2007. As CEO he is responsible for the units Strategy & Corporate Development, Human Resources, Legal & Compliance, Internal Audit, and the countries Spain, Portugal and Brazil. Prior to joining Atradius, Isidoro Unda served as CEO of the leading Spanish credit insurer Crédito y Caución, since 2001. He joined Crédito y Caución in 1988. Isidoro Unda has a degree in Law and Economics from Deusto University in Bilbao (Spain). He has worked in the financial and insurance sector for more than 20 years and has served on the Supervisory Boards of Inverseguros S.A. and Mutua Madrilena Automovilista. Andreas Tesch was appointed Member of the Management Board and Chief Market Officer (CMO) in October 2011. As CMO he is responsible for Atradius Credit Insurance worldwide (excluding Spain, Portugal, and Brazil), and for the units Atradius Dutch State Business, Global, Special Products, and Group Communications & Commercial Development. Andreas Tesch became Head of Global, Oceania and New Markets of Atradius in 2007 following six years in directorship roles with the company, spanning Risk Services for Central and Eastern Europe and Corporate Development & Communications. Prior to joining Atradius, Andreas Tesch was Director of Simon Kucher & Partners, where he advised clients on strategy and mergers & acquisitions. Christian van Lint was appointed Member of the Management Board and Chief Risk Officer (CRO) in November 2012. As CRO he is responsible for Risk Management, Group Buyer Underwriting, Risk Services, and Outward Reinsurance. Christian van Lint became Director of Group Risk Management in 2006 following four years in the role of Risk Services Director of the Netherlands and Nordic region. Since joining the company as an underwriter in 1983 he has developed his career in a wide range of risk management roles. Claus Gramlich-Eicher was appointed Member of the Management Board and Chief Financial Officer (CFO) in May 2013. As CFO he is responsible for Finance, Financial Control, and Corporate Finance. Prior to Atradius, Claus Gramlich-Eicher worked for Allianz in various senior financial management roles in Germany, Spain, Italy and the Czech Republic. Most recently he was Executive Director for Allianz Investment Management SE in Munich (Germany). Claus Gramlich-Eicher has a degree in Economics and Business Administration from the University of St. Gallen (Switzerland) and a CEMS Masters Degree in International Management. He has worked in financial services for more than 20 years. Marc Henstridge was appointed Member of the Management Board and Chief Insurance Operations Officer (CIOO) in January 2017. As CIOO he is responsible for Atradius Re, Bonding, Collections, Instalment Credit Protection (ICP), Project and Process Unit and Information Technology Services. Since joining the company as a UK Market Analyst in 1997, he was quickly promoted and has served as Director Risk Services for UK, Ireland (since 2008) and Special Products (since 2014). During 2013/2014 he also took on ad interim the responsibilities of Regional Director UK/Ireland. Prior to Atradius, he enjoyed analyst positions at large international financial services companies. 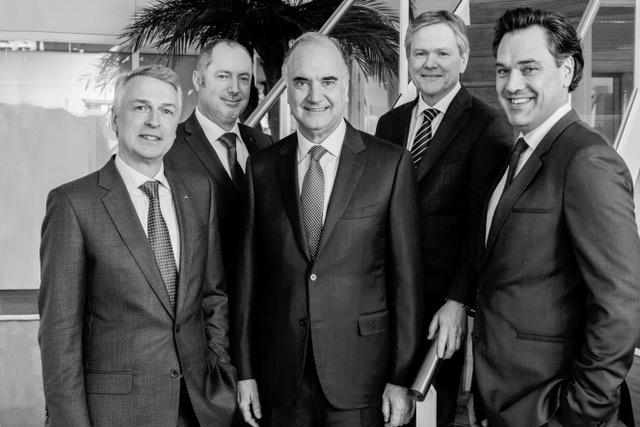 The Supervisory Board has ten members and is responsible for monitoring and guiding the general affairs of Atradius and the policy of the Management Board. Like the Management Board, it is guided by the interests of Atradius and the businesses connected to it. The Audit Committee supports the Supervisory Board in fulfilling its financial supervisory and monitoring duties. It oversees the integrity of the Atradius’ financial statements, the external auditor’s qualifications and the performance of internal and external auditors. The Audit Committee monitors the financial reporting process within Atradius and the system of internal controls. It also facilitates ongoing communication between the external auditor, the Management Board, the internal audit department and the Supervisory Board on issues concerning Atradius’ financial position and financial affairs. The Remuneration, Selection and Appointment Committee supports the Supervisory Board in fulfilling its governance supervisory and monitoring duties. It initiates proposals for the appointment of members of the Management Board and the Supervisory Board, the Remuneration Policy, the remuneration of senior management and other corporate governance matters. Through our Governance Principles, Customer Service Charter and investment in innovation, we’re committed to leading our people and customers to better products and services than anywhere else. As a company whose remit is to enable successful trade, our biggest corporate responsibility is an economic one. Trade is essential for the world’s economic development.